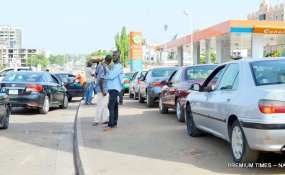 Fuel queue in Abuja (file photo). Mrs Ahmed spoke in reaction to the IMF's advice to the federal government to remove fuel subsidy, which might have led to panic buying in the country. "There is no imminent plan to remove subsidy," she said. "IMF said that fuel subsidy is better removed so that we can use the resources for other important sectors. "In principle, It's a good suggestion. But in Nigeria, we don't have any plans to remove fuel subsidy at this time because we have not yet designed buffers that will enable us (to) remove the subsidy and provide cushions for our people. "So there is no plan to remove fuel subsidy. "We will be working with various groups to find an alternative if we have to remove it. We are not yet at the point of removing fuel subsidy yet," she said. "In my capacity as representative of 23 African countries, I addressed the IMFC and issued a statement calling for normalisation of trade relations among the contending parties and called for concerted efforts to supporting multilateralism and avoid protectionist sentiments. "At the G-24 meeting, I drew the attention of the World Bank to some of the challenges we face in implementing our portfolio like the implementation of the new environmental and social safeguards framework which tends to slow down implementation of our infrastructure projects. "My engagement at the IMFC also focused on the global policy agenda. "Governors underscored the importance of strengthening market competition, encouraging innovation, tackling weak governance and corruption and meeting the SDGs. "Governors underlined the importance of strengthening international coordination and cooperation to tackle shared challenges, given the potentially damaging effects of trade tensions on global economic developments, and impact of natural disasters on developing countries," she said. "In the course of my meeting with officials of the International Finance Corporation, I asked for their support for our efforts to leverage the private sector capital to fund critical infrastructure in Nigeria," he said. "We reviewed the position of Nigeria in terms of financial inclusion, observing that the rate of inclusion is moving up aggressively and we are very optimistic that in 2020 we will meet the 80 per cent inclusion target. "We also met with foreign investors who expressed confidence in what we are doing in Nigeria and this has been supported by the inflows that you may have observed recently between December and this time. "A major take away from this meeting is that although the GDP numbers for Nigeria is low at 1.9 per cent in 2018, I'm encouraged by the IMF predictions that global growth will pick up by second half of 2019 and emerging market economies like India, Brazil, China and Nigeria will help to drive growth. "This means that a lot of eyes are on Nigeria and we must work hard to aggressively push up our growth numbers. But I'm hopeful that this can be achieved," he said.